Wonder Tape - 1/3 in. x 10 yards - Great for home sewing or crafting. A double-sided, transparent tape that disappears after first washing. Can be sewn through without gumming up your needle. Perfect for holding together seams or hems before stitching. finished size is 88 x 98 - price includes fabric, pattern, and binding. 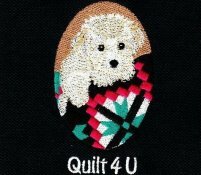 REMINDER QUILT 4U CLUB MEMBERS: Our 2018 holiday party for Q4U Club members is Sunday December 9th at 1:30. If you wish to participate in the gift exchange, please bring a gift wrapped with no names. We will have a late lunch and the store will furnish meat (ham) and paper goods. Bring a dish to share if you wish.